Compared to Germany and Spain, the United States is woefully backward in its development of wind, solar and other renewable sources of energy for electricity generation. But there is some good news on this front, as CleanTech notes. Utility-scale solar power generation in the United States doubled in the past year, from about 6,000 gigawatt hours in 2013 to 12,000 gigawatt hours in 2014. Utility-scale solar is on the verge of passing the symbolic 1% level of US electricity generation. 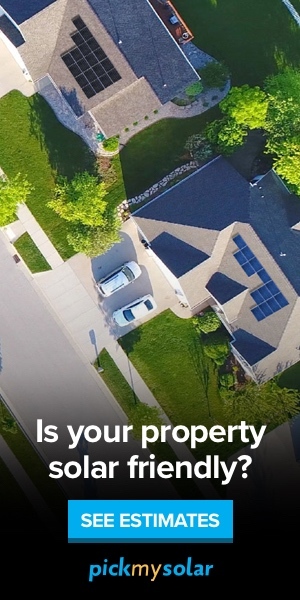 (Statistics don’t count the contribution of roof-top solar, which is the major form of solar energy in the US, so its actual contribution is much greater). Germany, which is not particularly sunny, generates about 7% of its electricity using solar. Spain gets about 5% of its electricity from solar. The US south and southwest and west is so sunny that it is crazy that the country has neglected this source of power. But that neglect is changing, because the price of solar panels has plummeted in the past 5 years. Non-hydro renewables are now 6% or so of the US energy mix, while with hydroelectric power renewables come to 13%. The US is producing about 5.5 billion metric tons of carbon dioxide every year, some 16 tons per person– the highest per capita in the major OECD countries. Just 50 US power plants account for almost as much CO2 as the whole country of Germany. Even if you count the CO2 produced in manufacturing and installing them, over their lifetimes wind turbines generate almost no carbon dioxide, and their fuel is free. 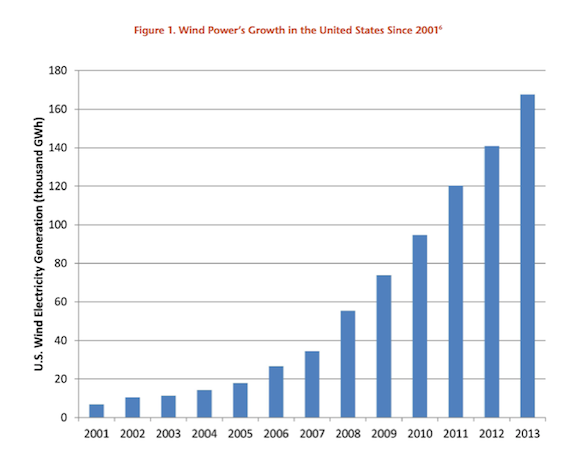 If the US could get to 30 percent wind power by 2030, it could reduce its carbon production to 40% under 2005 levels. There are now 117.3 GW of installed wind energy capacity in the EU: 110.7 GW onshore and 6.6 GW offshore. 11,159 MW of wind power capacity (worth between €13 bn and €18 bn) was installed in the EU-28 during 2013 . . . The EU power sector continues its move away from fuel oil and coal with each technology continuing to decommission more than it installs. Congress has kept the tax credit for wind farms this year, but it doesn’t do that much good, since wind entrepreneurs don’t know if the tax break will still be there in 2016 and so still cannot plan out wind farm construction and be sure what their margin of profit will be. But wind and solar are coming down in cost so fast that people with a need for inexpensive energy will keep installing them, even if via cooperatives.